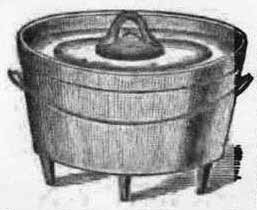 Researching Food History - Cooking and Dining: Dutch Oven - Iron or Tin or ... Brick? The iron bottom section has three legs so hot coals can be placed under the oven. The lids evolved over time to become a concave tight fitting lid to hold coals. 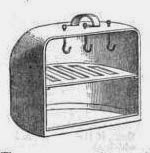 Historically it has been called various names - bake oven, oven, lidded kettle, bake kettle and more. 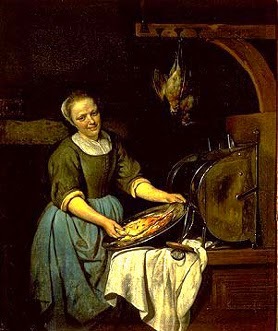 Two 17th century Dutch paintings contained what today is called a 'tin kitchen' - a shiny tin body to reflect the fire and cook meat on a spit; also items on a tray or on the floor of the oven. The first is from c1660, the second was forty years earlier. In a few HABS (Historic American Buildings Survey) reports, Dutch oven referred to the protruding back of an inside brick oven or a brick oven.